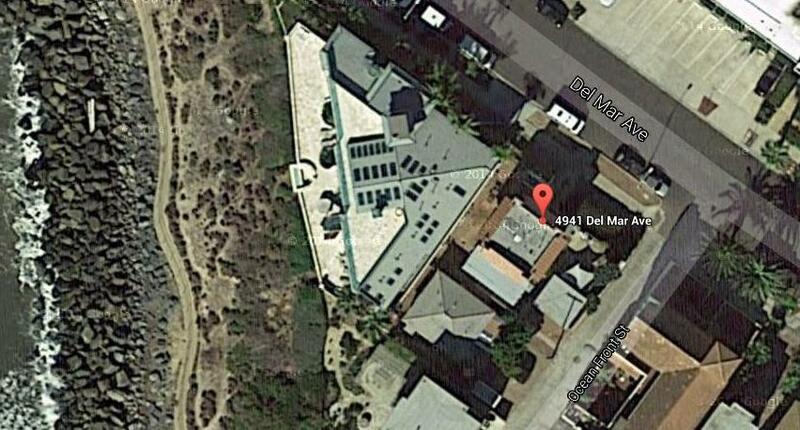 Aerial view of 4939-41 Del Mar Ave. 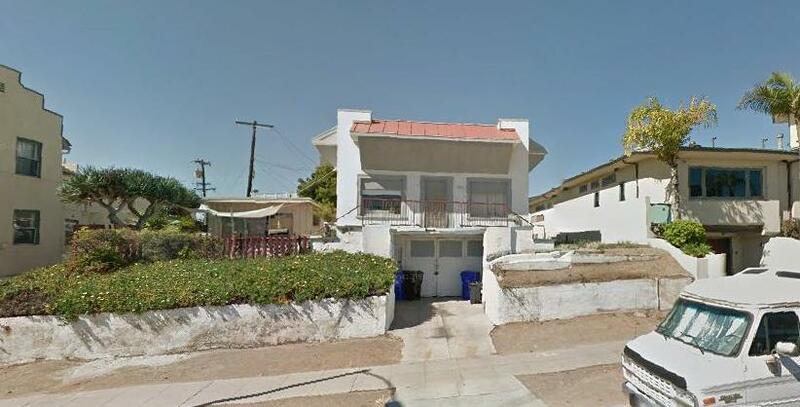 The big issue of its agenda is the application for a permit to demolish 3 units and replace them with three new units and a subterranean garage at 4939-4941 Del Mar Avenue (we believe the Action #3 agenda address is a typo). This project has bounced around since last Fall. It was originally scheduled for the Project Review Committee, a sub-committee of the Board – a prerequisite before review by f the entire Board on November 19, 2014, but the owner applicant cancelled at the last moment. It finally was reviewed by the Review team on April 15, this year, and now is before the full Board for a thumbs up or down. 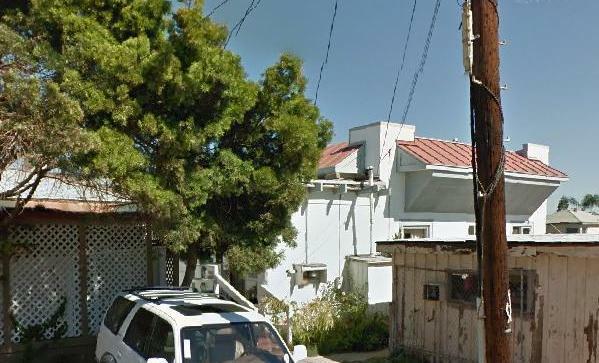 The Board is set to review the application for a Coastal Development Permit for the demolition of 3 existing structures and replace them with a 3-unit residential condominium with a subterranean garage. The site is a 6,800 square foot lot, very near the intersection with Ocean Front Street, less than a block from the beautiful Sunset Cliffs. Also on the Board’s agenda is the new Apple Tree Market going in at 4976 Newport Avenue. Specifically, it’s the owner’s conditional use permit application for a license to sell alcohol and a neighborhood development permit to resume its retail and commercial use. Their application appears to also include “previously conformed parking” (which we’re unclear about) – and parking for a food market on Newport is certainly an issue. There is a parking lot on the west side of the building, so perhaps this means the applicant -owner Saad Hirmez – is requesting that the lot be sufficient for its parking requirements. Hirmez had appeared at the May meeting with his preliminary floor plan, and was initially expecting a July 4th opening. But he told the planners that he hasn’t made enough progress to open then, but expects to some time this year. The small size of the building will require some adjustments. There won’t be room for detergents, beauty products and other items typically found at a grocery store, Hirmez said. Furthermore, “There’s no reason for it” with the proximity of two drug stores – CVS and Rite-Aid. But shoppers who expect and prefer natural foods will not be disappointed, Hirmez said. At least 40 percent of foodstuffs will be organic. “We know the community wants this,” he said. As for alcohol, Hirmez said police have approved the transfer of his license from the former location to sell beer, wine and spirits – though final approval from the state Alcoholic Beverage Control Department is pending. To gain police support, Hirmez said he agreed to several conditions, including: no single cans of beer, no half-pints or miniature bottles of spirits, no fortified wines and no sales after midnight. Of course, it’s also contingent on what the Planning Board does. But when Hirmez applied for his alcohol license, there were no protests – unlike what happened when CVS applied for theirs. Thirdly, the Board is to consider their letter in support of the Climate Action Plan, which came before the Board in May. The planners, like the OB Town Council, have been urged to join in the push to implement this reasonable course. 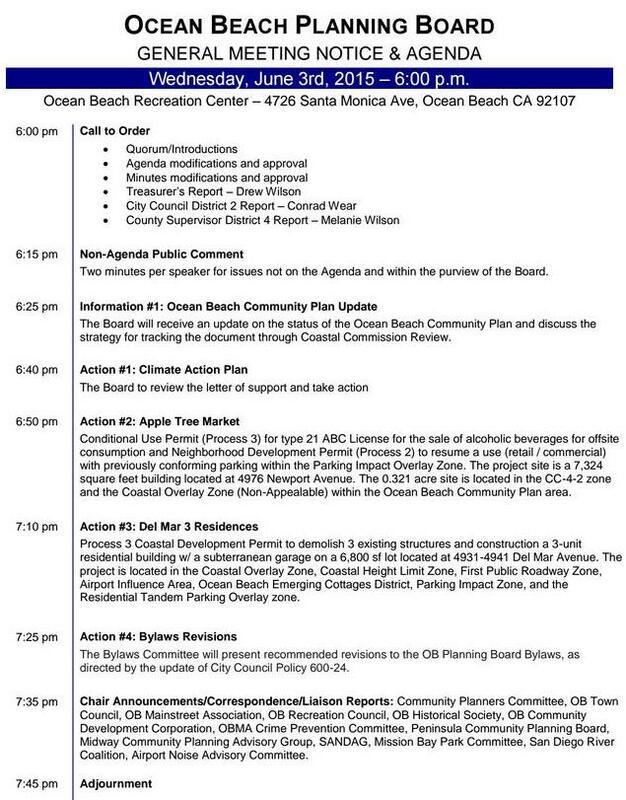 OB Community Plan and Coastal: The Board will be given an update on the OB Community Plan going before the California Coastal Commission in August. By-Law Revision: there appears to be a move to make a bylaw revision, “as directed by the update of City Council Policy 600-24” (?). Appointments: the Board could make an appointment to the vacant seats – there are 2 of them. So is the Apple Tree is going into the space formerly occupied by OB Surf and Skate (which moved over to 4940)? 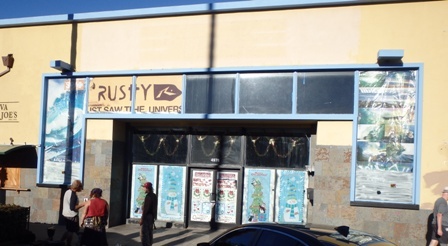 Yup, and former site of Rock Paper Scissors, former site of the Bank of America and before then ….